Japan-based security software vendor Trend Micro is planning a rare foray into hardware, with a home storage device for managing photos from multiple cameras and smartphones. 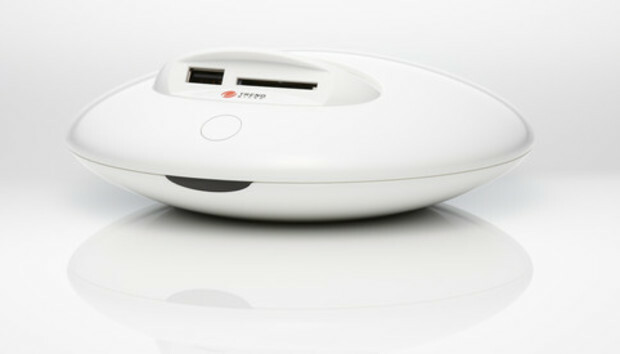 Trend Micro will launch its flying-saucer shaped "JewelryBox" in Japan on June 19. It has a slot for SD cards and a USB input for storing photos from digital cameras, and supports wireless connectivity for beaming photos taken using smartphones and tablets. The company will also offer an online backup service that can duplicate everything stored on the device. The JewelryBox and accompanying cloud storage service both have 16GB of memory, which the company says is enough to save 40,000 photos with an average size of 350KB each. The cloud service will come free for a year. It will cost ¥16,800 (US$170) in Japan. A company spokesman said the company is still in the planning stages for a possible launch outside of the country. The product is a rare hardware offering from Trend Micro, most commonly known for its security software. The company is hoping its status as a security developer and operating-system neutral vendor will draw customers to a crowded market for home storage devices. Other firms such as Sony are also trying to sell hardware bundled with their own cloud solutions. The JewelryBox comes with a remote control and HDMI output, for viewing and managing photo collections using a TV. Unlike rival offerings, it does not require a home computer to set up or use, and has a relatively simple interface. It can also send photos to friends or post them on social network sites. The device can automatically download all photos from connected digital cameras and memory cards, then clear them for more space. An app for Android smartphones, which runs in the background, will automatically upload photos to a home server. The company says it aims to sell 18,000 units during the device's first year, through the end of June 2014. The JewelryBox comes in black and white. Workplace automation: Is the UK worried? Will AI-based automation see humanity reach its own 'peak horse' moment soon?